Faysal Naji (far right) is a recent graduate from McMaster’s MD program and currently undergoing a 5-year residency program in vascular surgery at McMaster. 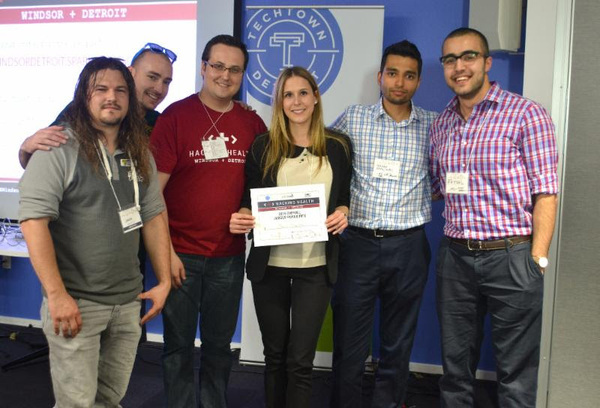 Faysal was part of the winning team Stent Trackr at the Hacking Health Windsor-Detroit in May 2015, the first cross-boarder Hackathon. Stent Trackr was awarded “Judge’s Favorite” and “Project Most Likely to be Implemented”. Technology professionals interested in e-health care may know how to build something, but don’t always know what health care needs. And doctors know what they need, but often don’t know how to build it. What has become an international hacking movement is slowly closing that gap. “When you bring these two groups together, it’s magic,” said Simon Woodside, entrepreneur and community organizer for Hacking Health Hamilton. Recently, Woodside hosted the third Hacking Health Café at McMaster University, luring a variety of tech developers, health professionals and designers to present their ideas and network. The innovation forum started in the city a year ago but Hacking Health and their annual weekend-long “Hackathon” workshops have infected cities across Canada, originating in Montreal in 2012. The goal: bridging innovation and technology with health care, around the world. Leo Godreault, 28, a nurse at St. Joseph’s Hospital, went to the first Hacking Café night in March and left with a job — a rare occurrence for a first ever event, according to Woodside. Working in the front line of a hospital, daily, Godreault had the knowledge the Toronto-based health-care startup “Shift Alerts” needed for its nurse management app. The two would have never connected if it wasn’t for that Hacking Health Hamilton Café. “In the old days, everything was in divots and events like this bring everyone into the same room,” he said. Convincing the startup to move to McMaster Innovation Park, Goderault is now a lead entrepreneur on the team that will be implementing Shift Alerts into Toronto and Hamilton hospitals. At the Windsor Hackathon this year, 23-year-old Faysal Naji, completing his five-year residency program in vascular surgery at McMaster, developed his team and their idea for the Stent Tracker app. Numerous people who have had heart disease or surgery will have stents implanted, but cannot remember information about the stents for future appointments. So when the patient needs to access that information quickly at a medical visit for example, Stent Tracker can store that information and make it accessible for physicians. “The concept is simple, but the ripple effect will be much greater,” said Naji. Since March, Naji and their team have been working to bring the app to fruition after winning the Hackathon’s “Project Most Likely to be Implemented” award. Hacking Health Hamilton will host its first Hackathon in February of 2016. Registration is available online.